Winter 2011…Our first year, the guys here were joined by a small number of other local folks and their support people who were interested in helping out and learning about the animals as well as growing sunflowers. 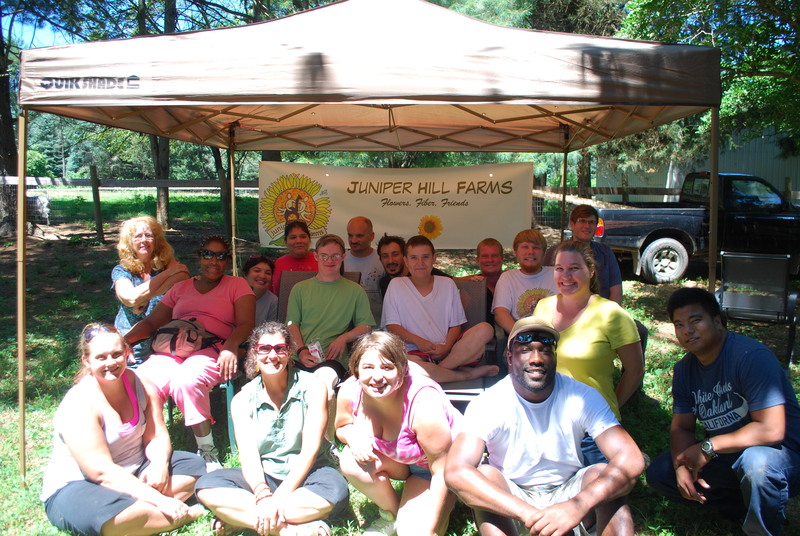 We are hoping to make it official this coming year, and have Juniper Hill as a valid option for volunteering and eventually a paying job for adults on the autism spectrum. We are now registered as a Wwoof Host Farm! Wwoof stands for Worldwide Opportunities on Organic Farms, and it is a program that links volunteers with organic farmers. We are hoping to host a group of volunteers that will work alongside the guys and their support workers as they grow sunflowers and take care of the animals, as well as all of the other projects going on about the farm these days. 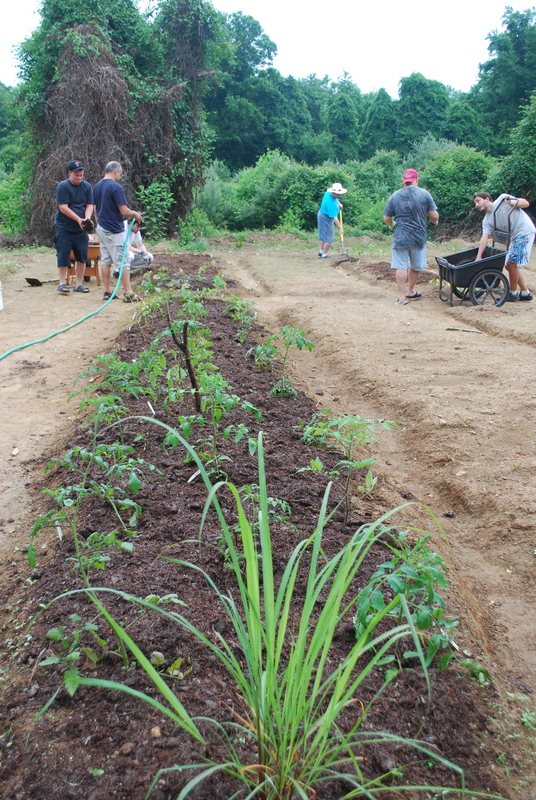 check out the Wwoof program here! each year after the first hard frost… so our growing season has definitely ended. Although we struggled all summer trying to grow healthy sunflowers, the human aspect of Juniper Hill is thriving! We have a wonderful community of friends and volunteers, and each Wednesday we all worked together in the flower fields and with the animals. Afterwards, Jose and his support worker Carin cooked us a wonderful lunch and we all ate together outside on picnic tables. 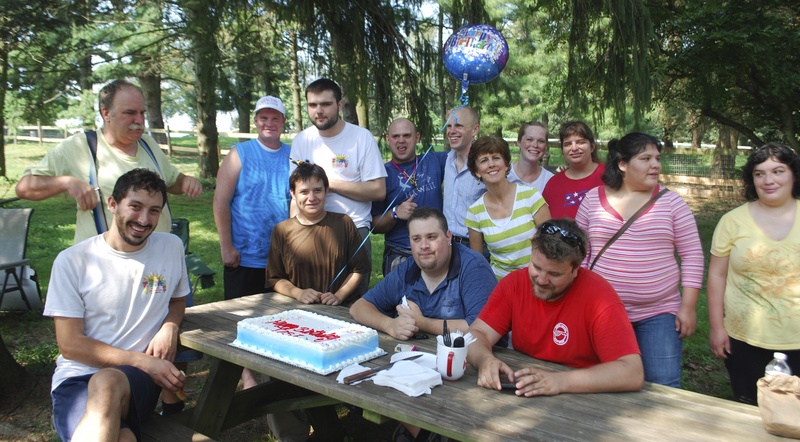 We celebrated holidays and birthdays, and Andy’s homecoming after his 2 months away with a broken ankle. We had three long term WWOOF volunteers living here and helping out, making sure the chores were done, doing lots of extra weeding, and giving lots of love to the Angora bunnies! WWOOFers Rachel and Steph are here through March and we are settling in and ready for a cozy winter of indoor household renovation and repair. Update Winter 2013… Our family is growing, and Wednesday Volunteer or Bingo Days have become a tradition in our circle of wonderful friends. 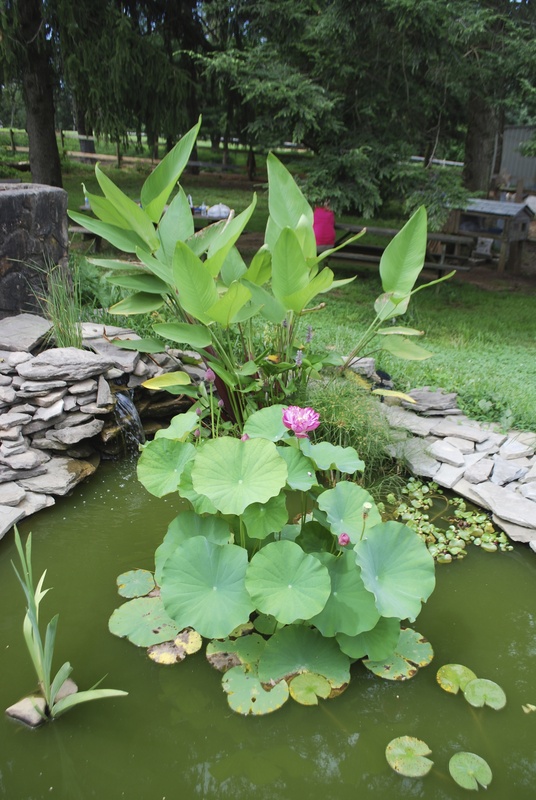 We finally finished Ray’s pond this year, it’s beautiful and the fancy goldfish are growing! 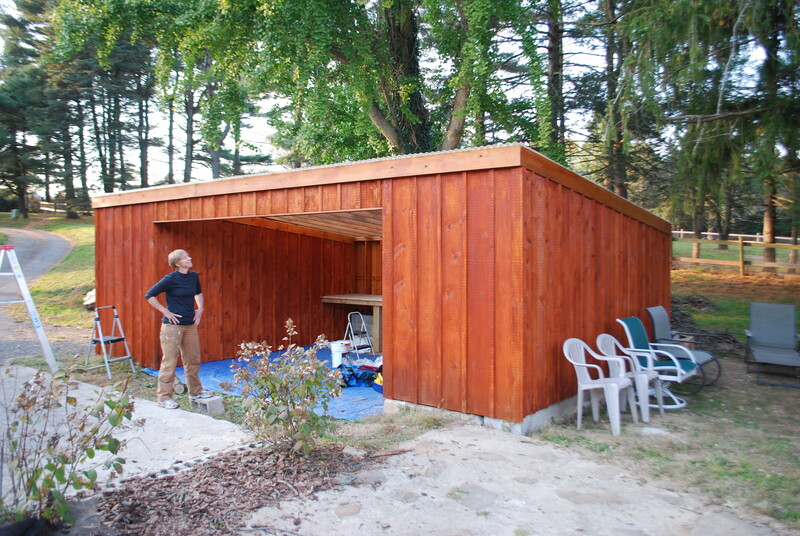 The Eagle Scouts built us an amazing shed, and we are looking forward to using it as our work area next summer. 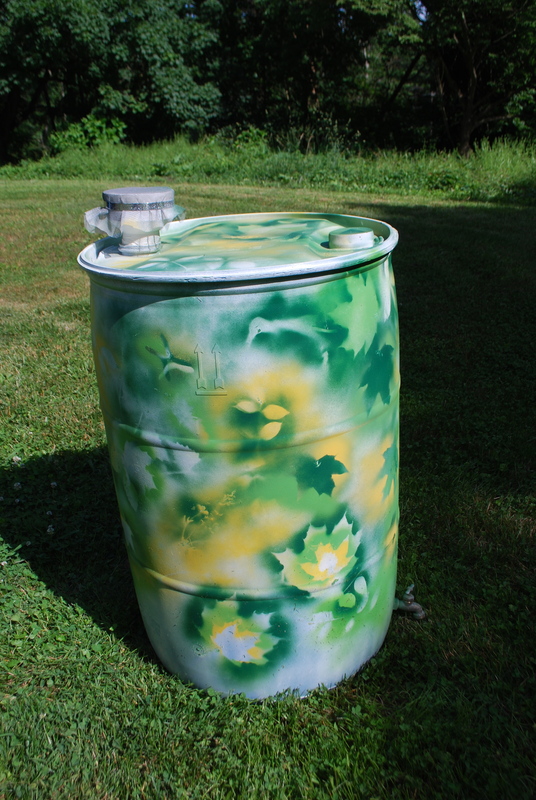 We made some incredible rain barrels and are working on perfecting them for market this season, and we continue to celebrate birthdays… from September through February we sing to someone ALMOST every week! We love our red shed! Check out our ‘Feeling like Fall ‘ video!